This is what happens when the government just keeps tacking more and more onto the same legislation through the years. 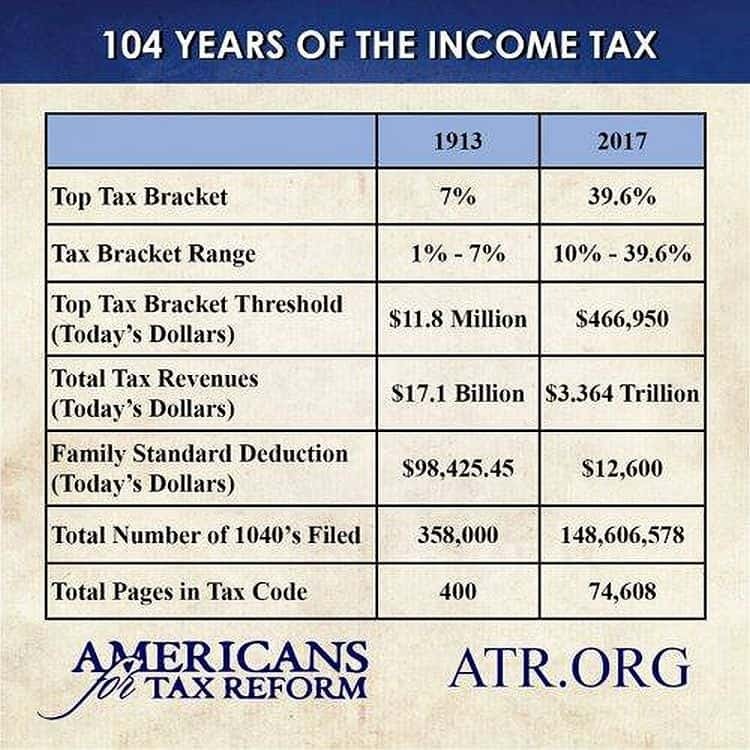 From 1913 and a 7% top rate, the Tax Code has become a monster with a nominal 39.6% top rate — which is a lie because it doesn’t include the taxes contained in Obamacare, another 4%. That is what we are up against. The last time the Tax Code was touched with any diligence was 1986. That’s thirty-one years ago. Tally ho, y’all. Good luck and Godspeed. The Speaker of the House conducting negotiations on the US Tax Code in 1986. But, hey, what the Hell do I really know anyway? I’m just a Big Red Car, but it’s Friday Date Night. Be nice to someone today and be nice to yourself. You deserve it. This entry was posted in Taxes, Uncategorized and tagged tax code. Bookmark the permalink. The last time the tax code was overhauled was 1986. The US has done this roughly every 30 years – we are due. The Boss is spot-on. Let us also meditate on the wasted motion/effort/time/resources spent by every family and business on compliance to this monstrous thing that lives amongst us, and subtly shapes so many of our decisions. What if, what if, what if, this were lifted off our shoulders, and we were allowed to spend our energies creating useful things, building useful structures, selling them to one another? Surely we must fund a federal government, but can there not be some sane approach? It is almost frightening to contemplate what we would all do with our additional time. 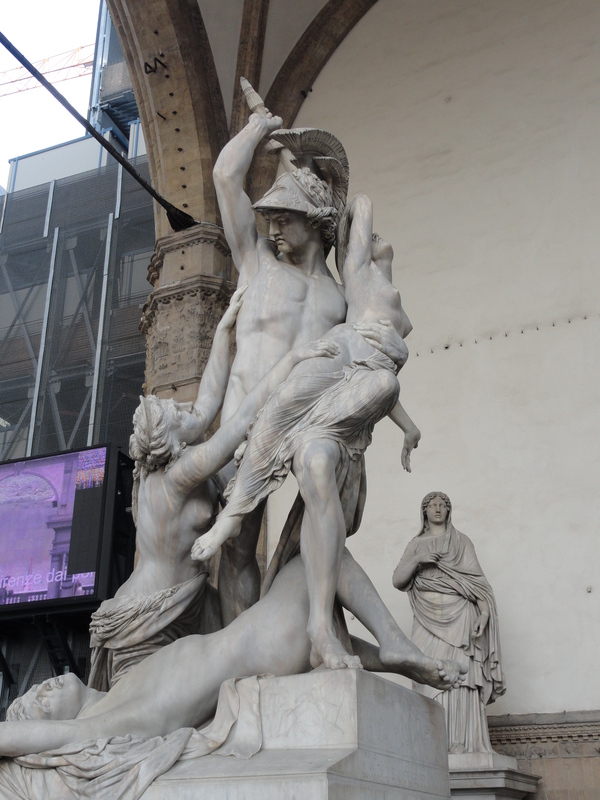 Ah, poor virgin Polyxena as Achilles has his way with her. IIRC, at one time much of the revenue for the Federal Government was from tariffs. Another argument for tax reform is the claim that part of the US with the highest per capita income is within 100 miles or so of the Washington monument. At least at first cut, some of the spending can look useful, e.g., NIH research that has made progress in medicine. But if take a second look, a lot of good medical research is funded by gifts from wealthy people or their foundations or by profit making companies. E.g., IIRC Mike Bloomberg has given well over $100 million to Johns Hopkins University, especially their medical school, school of public health, etc. So, maybe if taxes were lower and the private economy doing better, then there would be more such non-government funding of medical research? As it is, it does appear that the NSF and NIH funding of research, the research universities, and the research hospitals are doing the US public, net, long term, a lot of good, about the most good of anything. There are claims that if the tax rates were lower, then the economy would be enough more active to generate more tax revenue instead of less. Or, maybe the analogy is, at current tax rates, we are so eager for more golden eggs that we are choking the goose that wants to lay golden eggs. Or, IIRC we have ballpark 90 million people who could work but are not working; have them all working, making money, going to restaurants, buying cars and houses, putting kids through college, taking nice vacations, wearing better clothes, buying up to date consumer electronics, etc., then maybe, net, the tax revenue would increase. Or, employers can fire US citizens and import non-citizens to work for less and/or send the work out of the US, but then the US citizens out of work draw welfare from the public — sounds like no bargain. Or money used inefficiently is, net, waste for the whole country: So, if DC spends money inefficiently, and no doubt at times it does, then that hurts us all. It would be good to great to have some clear and solid science of the economy, what a dream, so that we could be well informed on the options. There it looks like she’s being really nice to him, but it also looks like he may not come back! Maybe he’s off to fight the liberals for lower taxes! Every time the US has reduced taxes, revenues have INCREASED. JFK knew this. He was a good tax cutter. IIRC JFK followed the ideas of economist Walter Heller. IIRC, Reagan did something similar. Results: By Clinton’s second term we’d nearly paid off the national debt, and Wall Street was worried that there would be no more T-bills as the base, rock solid, risk-free investment. So, yup, with these two examples, we should chop the heck out of taxes likely essentially as Trump often outlined in his campaign. I suspect that Heller and Reagan were correct, but I’d like us to “measure twice, saw once” and have much more solid evidence of what the macro economic results would be. I know: Anything solid about macro economics is fantasy land. Then, of course, with the tax cuts, etc., there would be a delay running a bigger deficit until the economy got going enough faster to generate the extra revenue. I’m guessing that during this period Chucky Schumer will be yelling and screaming with Diane Feinstein, Maxine Waters, etc. that (A) the deficit is bad but (B) if we are going to run a deficit then we should keep taxes high to help make the deficit smaller and spend the extra money on more spending, not lower taxes. That is, Schumer and his girls will vote for a deficit IF they can increase spending and, thus, net, further slow the economy and put more people out of work. Trump has tried to push through some visible budget cuts, e.g., the National Endowment for the Arts, PBS, EPA, Department of State, and roll back a lot of regulations choking the goose that would lay golden eggs, but I sense that no way, not a chance, no one in Congress will go along with a Trump plan like JFK and Reagan did. Why not? There is too much interest in spending to buy votes and/or campaign contributions. Maybe Trump wants some fast action against ISIS, the Taliban, and Iran and wants China to put NK Chubby on a diet — no more missiles or nukes. Chubby will have to use something other than the idea of sending missiles with nukes to the turn the US into “ashes” to keep his power, and French cheese, by being a dictator running a military state. Then maybe health care will get done. Then maybe somehow, e.g., hogtie both Paul Ryan and Chucky Schumer, push through some obvious budget cuts, get/keep the Fed on the team, and then cut the heck out of taxes, have companies bring back the several $T and invest it in the US in new products, plant, equipment, and training, have trade deals that get the US trade in balance and, thus, greatly increase the demand for labor in the US, have the promised training in the poor central cities, have some tariffs that help the demand for US labor and also generate some revenue, get US energy producing more, hiring, and reducing our trade deficit, have the infrastructure $1T as more in stimulus, watch the stock market and the number of people employed skyrocket, etc. and, then, see the revenue increase and the budget go deeply into the black. But Schumer, etc. would rather have the US go into a great depression so that Democrats could save the country with more welfare spending. I fear that in simple, blunt terms, the dream of socialism is alive and well in much of the Democrat party — none of the history of sorry failure of socialism changes minds of those people. The Schumer idea is, poor people need help; if the Democrats give them help, then they will vote Democrat; so for more Democrat votes, sabotage the economy and generate more poor people. If that doesn’t work, import poor people. For a medical doctor to be like Schumer, he would go around at night spreading disease so that in the morning he would have more patients. While socialism is one way to mess up the country, there are also many more. Paul Ryan also has his ways to mess up the country. W’s trying to bring Jeffersonian democracy to Iraq was another way. W’s ideas, with Fannie and Freddie, of underwriting used Charmin as home mortgages, blowing a housing bubble, and wrecking the US financial system was another way. Flooding the country with illegal immigrants was another way. Having the US Department of Education push their Common Core to try to “teach to the bottom of the class” so that W could dream about “no child left behind” and assuage his white guilt and, thus, basically wreck US K-12 education was another way. ObamaCare and the intention to have it be a train wreck so that it would lead to the coveted “single payer” was another way. Shutting down US usage of fossil fuels was another way. Having the EPA go on some quasi-religious, wack-o, smoking funny stuff, take us back to the 100% all-natural life of Little House on the Prairie was another. Assuming that if are nice to the radical Islamic terrorists then they will be peaceful, contented, and cooperative — another one from the Democrat basket of wack-o, shoot us in the gut, smoking funny stuff ideas. Lots of ways to mess up the country. Maybe Trump will have to do a lot of horse trading on The Hill and give a lot more rallies. Gee, Trump just did some fence mending in Paul Ryan’s district! This Paul Ryan guy needs to be beaten “like a rented mule” just to see if he is asleep or really dead, if not dead, then get him awake and paying attention to something other than getting Federal money to his business buddies so that they will give money to his PAC so that he can use his PAC to elect Congressmen so that they will vote Ryan as Speaker. What scam. Schumer and his girls will do all they can to ride their socialistic dreams until the US is a total basket case and then claim that the solution is still more socialism. The Congress gets ready to tackle the Tax Code having done such a crackerjack job on repealing and replacing Obamacare, no? but they want to replace it with Barney Frank’s “single payer”.